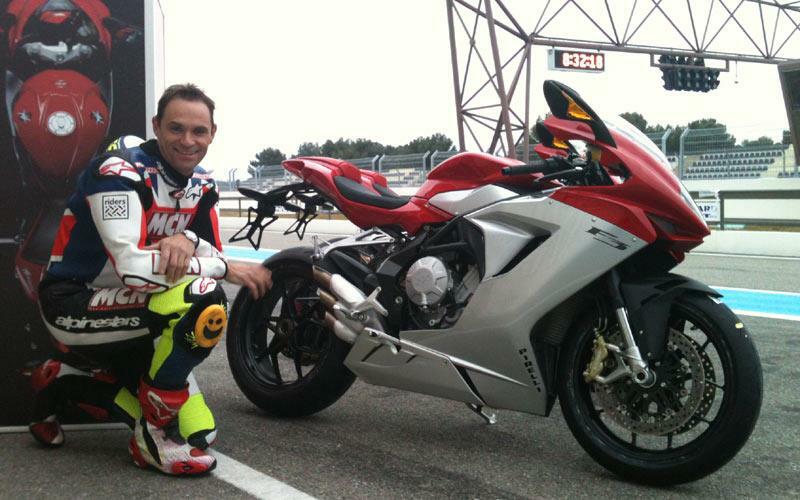 ﻿ MV Agusta F3 first ride: "tiny, loud and angry"
MCN's senior road tester Michael Neeves is in the south of France for the official launch of the new 675cc MV Agusta F3. It's a critical bike for MV – because it's relatively affordable (at £9999 it's in the same ball-park as rivals) and it could open up a whole new market to them. But, clearly, it has to work. "It's -3 degrees C so MV has sent us out behind a camera car for pictures first – it's too cold for proper track sessions at the moment. Just riding the F3 slowly I'm impressed. "It's like a tiny, loud, light, angry, stiff World Superbike racer, or a pukka 250GP bike. It's like no other supersport bike I've ridden – so raw, and more race than track. I can't wait for a proper blast when it warms up - I'll keep you posted." "I've had a couple of sessions out on the F3 and am getting to know it a bit better. Paul Ricard is tough to learn, it's so big there's little impression of speed and it's freezing cold. It's not the best chance to show off a new bike. "It feels every inch a track-ready racer, it steers quickly, gives loads of feedback for grip and the brakes are superb. It's fast, but revvy - a Daytona 675 or GSX-R600 have a lot more grunt and a far smoother throttle. "The throttle response on the F3 can be a little snatchy and hesitant depending in which of the four power maps you're in. "Still a few more sessions to go to really get to know the MV..."
"All the makings of a class-leading supersports but it's flawed"